I woke up to the dulcet tones of rugby commentary as Pete had done the 4am wake up to watch Australia and England. As I woke and got up, so Australia won which means England cannot get beyond the first round, and Wales are through. Even worse for Clare, we ran out of gas before she had had her first cup of tea! Fortunately there was a spare and before things got really bad, the kettle was on. We sat around and had a leisurely breakfast, catching up on blogs and posts, and Clare going through the photos. Some of the photos are great, particularly the whale and dolphin pics, and there are millions of sunsets, sunrises and moon pics! I went to sit on deck as it was warm as, and watched things going on all around. There was a little fisho on the beach looking like they were gathering bait. Lots of little tinnies going back and forth. 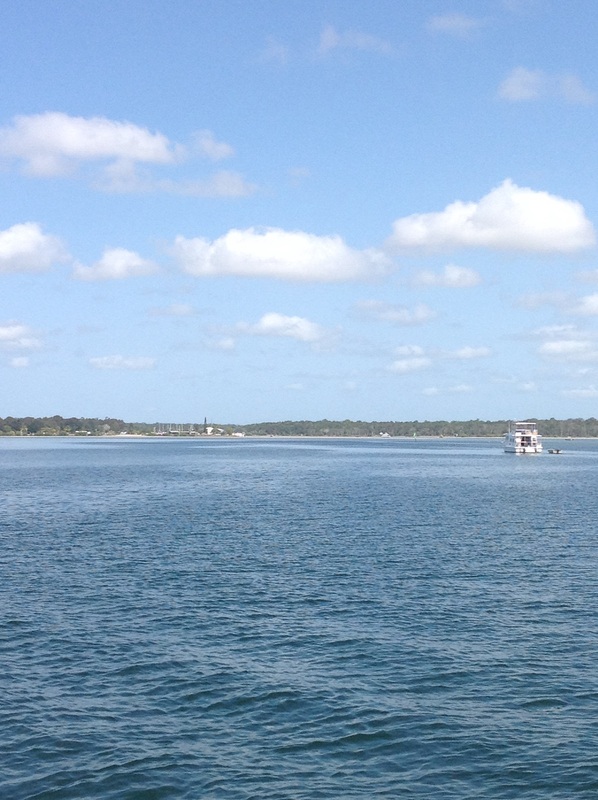 A jet ski came out of Tin Can Bay at about 40 knots, did a big turn and whizzed back in at 40 knots. A houseboat, came by, tried to drop anchor, couldn’t find how the let it go, then did, immediately picked it up and headed off! A little sailing boat came out, with both fenders on, put up the sails and sailed back and forth across the creek, never making forward progress, and doing some awful tacks, then going back in. A massive trawler came out and dropped his gantries as headed up towards Wide bay. It was non stop action, and great to while away the time watching! Finally we had to get going and Clare drove Pete and I in budgie to the shore so we could refill the gas ,bottles and drop the rubbish. We headed off to the beach and made it comfortably ashore, and the servo was just a short walk up from the beach. 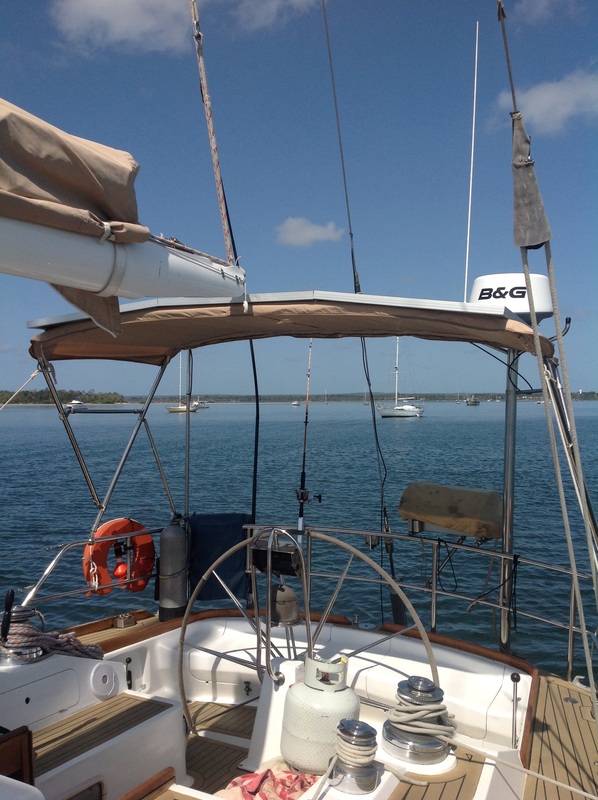 As we filled the gas and the small outboard jerry, we had ice creams – yum! Then back to budgie for the trip home to Pilgrim. We dropped off the gas, and other extraneous bits, and then headed out to the crab pot to see if we had caught our 4 mud crabs. Again, Clare did a sterling job of driving budgie, and holding her at the pot as we got there. We pulled up the pot, and behold! 3 muddies! Though one looked definitely small, we weren’t sue about the others so thought we should take them home to Paul to show him the outcome of our labours without him! We scooted back grinning with our spoils, but Paul made us chuck them all back as all being too small. 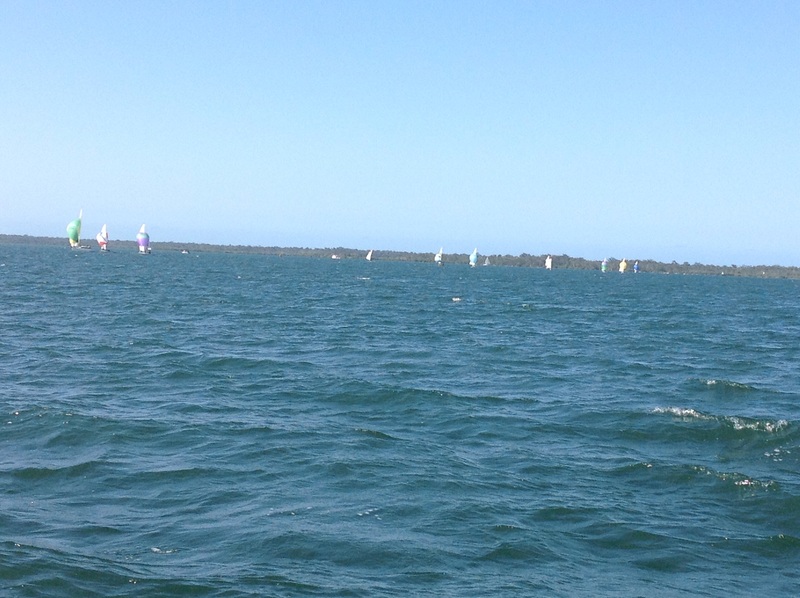 The yacht club was setting up for a race with the start line about 50 meters from our stern, so we watched the start and were in the thick of it to use our superior sailing skills to out sail every boat on the fleet! Our matey from the practice this morning was out, and I dont think his practice had helped much, but he was out there enjoying the racing like all the others. 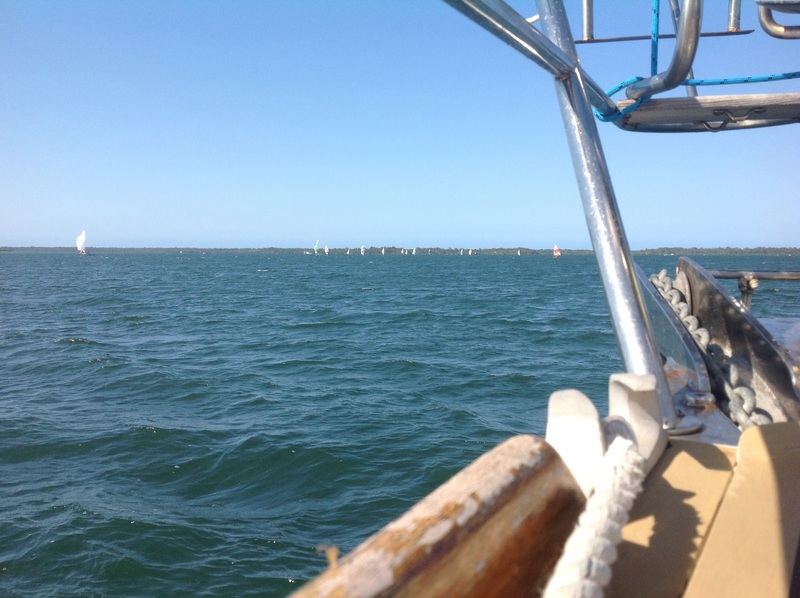 It was a glorious afternoon for it, and we had lunch of leftovers, whilst watching the fleet sail all around us. Talk about a grandstand view! Afternoon rests, then heading into the yacht club for a shower, and to visit the fish co-op for dinner. Pete stayed asleep after his early start to the day, whilst Paul, Clare and I headed in. Paul went to the club, whilst Clare and I strolled down to the fish co-op. They were getting ready to close, but we were able to buy some lovely reef fish fillets, which were a lot like bream. Then we popped into the VMR station to chat about the the bar and our intent to cross tomorrow. They gave us the waypoints and confirmed the tides, though they said it had been wild today, with about 1.5 meter swells. They also said that it was around 4 m at LAT, so with the high tide, we should be ok. However, we should take care to go through on the high tide. That is at 2 pm. Clare and I then joined Paul at the club for sunset watching and drinks. Though it was late in the afternoon, we got back to the boat in daylight and watched yet another spectacular sunset, though no pics this time! Pete had just woken and had the footy on the TV, so as we prepared dinner of fish, roasted ratatouille, sauté potato and rocket and pare salad, we watched the start of the all Queensland final. By half time, the spuds were close to ready, so Clare and I had to finish the fish on the BBQ and we served up with about 20 minutes to go. We were glued to the TV as we ate as it was such an exciting game and when the Cowboys scored a try to equalise as the hooter went, it looked like they had it in the bag. But Jonathan Thursten missed the conversion, so it went to extra time! However, the Cowboys carried the day within 2 minutes with a drop goal, so they did win. Sated and having watched too much sport, and after another full on day(! ), we retired after doing the washing up for a restful nights sleep.